One of the things I love most about winter and early spring in Marin is being able to hike to a beautiful waterfall, and when it rains families have many to choose from. The waterfalls in our list here all involve hikes of varying length, and all are perfect destinations for a family outdoor outing. There's something for hikers of every ability here. All of these waterfalls are at their most spectacular after a big rainstorms. This also means the trails will be pretty muddy, so make sure you put on the rain boots and dress the kiddos in something that you don't mind getting dirty. Here are four of our favorite Marin waterfall hikes, in order of difficulty (although all of them are family friendly). All but two of these hikes (Cataract Falls on Mt. 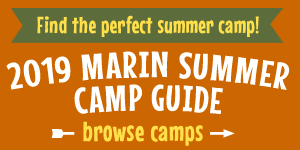 Tamalpais, and Cascade Falls in Mill Valley) are on lands administered by Marin County Parks; visit their website for more info and to download printable trail maps for each preserve. Mill Valley's Cascade Falls is Marin's easiest waterfall hike and one of the most spectacular. The falls are a short quarter-mile walk from the trailhead on Cascade Drive, just off Throckmorton Avenue. The walk takes you through a peaceful redwood forest to a waterfall that plunges 15 feet into a clear pool that feeds Cascade Creek. Along the way there are plenty of benches to sit on and take everything in. Cascade Falls' short trail and mild elevation changes means that this is a perfect waterfall hike for all ages. It's not suitable for an offroad stroller, though. If you're up for a longer hike, try taking the trail all the way to Cascade Falls from downtown Mill Valley or Old Mill Park. Not to be confused with Cascade Falls in Fairfax (see below). The Waterfall Trail at Indian Valley Open Space Preserve in Novato offers a short and easy waterfall hike that almost anyone can manage. We've even seen sturdy offroad strollers on the trail. Take the Indian Valley Fire Road from either the Indian Valley Road trailhead or from the back of College of Marin's Indian Valley Campus to where it meets the aptly named Waterfall Trail, where you'll cross over a little wooden bridge into the woods, with a stream burbling trailside. The walk there on the fire road is about a half-mile from the IVC parking lot and slightly longer from the Indian Valley Road trailhead. Once you turn off onto the Waterfall Trail, it's about a quarter mile to the waterfall, which plunges about eight feet down a smooth rock face from the stream above. It's probaby the smallest waterfall out of all four, but it's a beautiful hike and the waterfall can really get going after a big storm. This hike is popular one for Marin families, and for good reason—the waterfall at the end of the trail, known as the Fairway Waterfall or Buck Gulch Falls, can be really amazing, especially when it's been raining heavily. The hike there is a fun one as well. At about a half-mile each way, it's a little more challenging than the one at Indian Valley, mainly due to a trail that's narrow at points and the fact that you often have to ford a rushing creek at two points along the way (but then that's part of the fun). Make sure you wear your rain boots on this one! The 30-foot waterfall cascades over a cliff into a rocky pool below. It's a peaceful spot to take a break to prepare for the return hike and listen to the soothing sounds of splashing water. This hike crosses through the Ignacio Valley Open Space Preserve and through an easement on private property, so make sure you respect the owner's privacy and stay on the trail. The most challenging part of the hike to Cascade Falls near Fairfax is parking, which is along the street in the neighorhood bordering Cascade Canyon Open Space Preserve. Follow the trail along San Anselmo Creek to 20-foot Cascade Falls, which thunders over a stone cliff into Cascade Creek, which merges with San Anselmo Creek further down the trail. Like all of the waterfalls in our list, Cascade Falls is best viewed after a heavy rainstorm, but this can also mean that San Anselmo Creek is running high and fast, which makes it tough to cross. The appropriately-named High Water Trail bypasses the creek, but is narrow and steep in a few places. Not to be confused with Cascade Falls in Mill Valley (see above). Mt. Tam's Cataract Falls offers not only the most challenging hike of our four picks, but the most dramatic waterfall experience, too. Park at the Rock Spring trailhead and follow the Cataract Trail through a magical landscape of ferns, firs, moss-covered rocks, sprawling oak trees, and Cataract Creek running alongside. The hike is a little over two-and-a-half miles out-and-back, and has some decent elevation changes, but it should be manageable by most kids—we always see plenty of families when we hike here. The falls get more and more magnificent the further down the trail you go.